This is my new link to my blog site to get the word out to old Air Commandos. It is a simpler way of finding out about the latest. Recent postings are listed on the side. The archives are listed by date. You may also enter your own comments at the bottom of each post. 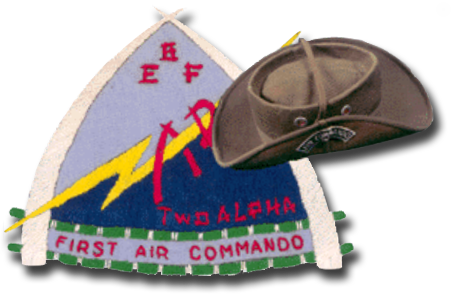 The Air Commando Association(ACA) is an organization formed during the Vietnam war by Air Force personnel who served in Jungle Jim, 4400 CCTS, Air Commando Units from all wars, Special Operations units, Special Air Warfare Center, Combat Application Groups, Project 404, Raven FACS, Combat Control Team, and all members who served with units equipped with the following aircraft performing special operations missions: A-1, A-26, A-37, U-10, T-28, C-47, C-7, C-130, C-123, C-119, O-1, O-2, OV-10, L-1, U-10, UC-64, L-5, B-25, P-51, C-46, Helicopters: YR-4, CH-53, H-34, MH-53, MH-60, UH-1(), Waco Gliders, all gunships etc. The purpose of the ACA was to keep alive the Air Commando spirit, to rekindle comradeship of wartime relationship, to honor the dead and the living who participated in our wartime effort and to promote the utilization of lowkey peacekeeping activities of special operations. As the ACA matured it also contributed to nation building and healing by providing medical supplies and personnel in countries which we had served in, promoted the children of our members, both deceased and living, by offering scholarship, offered our experience to the US Air Force, contributed to the history of our units and made the world aware of our sacrifices for our country by our members. There were over 300,000 personnel who served in these units from 1961-1980. The ACA has over 3000 active members. It has a history of over 50 years with the first Air Commando unit established in 1943 and commanded by Col Phil Cochran immortalized by Milton Caniff in his comic strip Terry & the Pirates as Steve Canyon from 1944-1988. There are four membership categories to include those who served in our units, those who served in our sister services or Government agencies, associate members and special membership. Membership cost $20.00 per year and benefits include a quarterly newsletter, a yearly reunion at Fort Walton Beach, FL and association with the finest airmen in the world. Membership applications can be had by writing to the ACA Florida address above. If anyone has contributing and appropriate home pages that will complimnent our home page please let me know and I will evaluate it for inclusion in this home page as a link. Please send all communications to e-mail to aircommando1@earthlink.net. This ACA home page is not sponsored, supported or approved by the USAF or DOD. We are currently updating this website. We apologize for any inconvenience.